While I always say that I'm going to try to cut down on snacking, let's face it, that's like me attempting to make it through the morning without coffee or to stop obsessing over my email. It's just not going to happen. Alas, even though it makes my taste buds happy to grab a candy bar or sneak a few chocolate chip cookies while my kids aren't looking, my waistline and my conscience continue to disapprove. Why can't someone invent a luscious brownie that has zero calories? 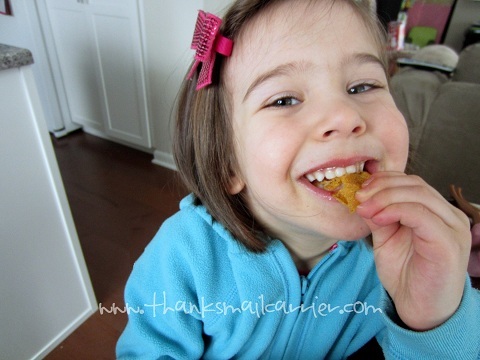 Or chips that are made with real vegetables, include whole grains, and still taste amazing? I haven't discovered the former yet (if you do, email me immediately), but to my complete and utter astronishment, the latter exists! 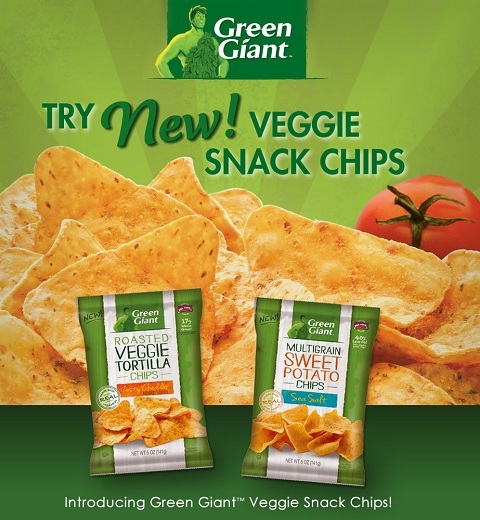 As a giant surprise that we can all appreciate, the Jolly Green Giant has now debuted a great tasting chip that you can also feel good about eating: delicious Veggie Snack Chips! I'll be the first one to admit that I've tried chips made from vegetables in the past... and I haven't been wowed. So when I heard that Green Giant had added these snacks to their already-vast collection of canned and frozen vegetables, I didn't have extremely high expectations for their taste. The Green Giant Roasted Veggie Tortilla Chips – Zesty Cheddar Flavor are made with real vegetables, include 17 grams of whole grain per serving (48g are recommended daily), and are naturally flavored. 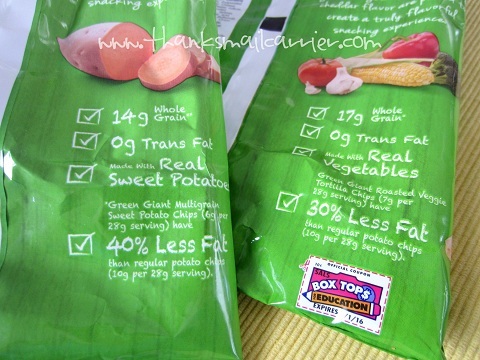 At the same time, the Green Giant Multigrain Sweet Potato Chips – Sea Salt Flavor are made with real sweet potatoes and include 14 grams of whole grain. Plus, they contains 40% less fat than regular potato chips (only 6g of fat per 28g serving compared to regular potato chips' 10g of fat per 28g serving). But let's face it, if they taste like cardboard, I'm not eating them no matter how healthy they might be. First, the Sweet Potato Chips. Now, hold on a minute, these are GOOD. Filled with plenty of crunch, just enough salty sweetness, and a light, crisp flavor, I suddenly found myself going back for another. And another. And another. After all, they're made with sunflower oil, so they contain less saturated fat... so it's all right to have an extra handful or two, right? ...and, even though she agreed that they were extremely yummy, I have to admit that I greedily put the bag away so that I could eat them myself later on. ...I wouldn't even hand over a single chip. I wasn't willing to share even one. To say that I was instantly obsessed with these cheesy, crunchy, delicious chips is somewhat of an understatement. 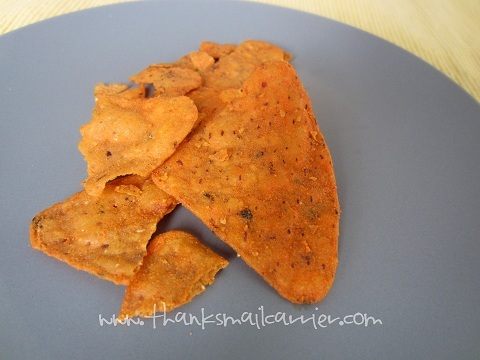 They taste similar to a popular nacho cheddar tortilla chip that we all know, yet more... real. Maybe it is the whole grain corn, the dried red and green bell peppers or the sunflower oil, but these Green Giant Veggie Chips don't have any sort of "junk food aftertaste" (or bellyache) as the others do. See how there is just one full chip in the photo above? That's not because the bag came with a whole lot of broken pieces, that is because that was the only full chip left when I went to take a picture. While I'm not proud of my greed, I am quite happy to have been introduced to Green Giant's newest product. Considering how much I love the taste (and how much I know my whole family would concur as well, if I ever decide to share) and all of the better-for-you, non-greasy, natural ingredients, these will surely be making more appearances in our house in the future. Who knew that Green Giant had such skill in the chip category? 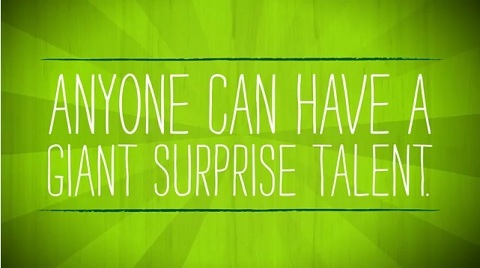 In celebration of this surprise, they are on the hunt for more talented folks — you'll want to check out the surprise talents they've unearthed in this video and even more of the Jolly Green Giant's favorite surprise talents at the Green Giant YouTube channel. Have a surprise talent of your own? Be sure to share it with the Giant as well and you might end up in their online film (there's also a printable coupon available for 75¢ off of your Green Giant Veggie Chips, so head over there even if you don't have a talent to show off)! Next time you're at the store, pick up a bag of these new chips — be sure to get two if you think that your family will want a taste, because once you try these, you might not want to share! i want to try these but an a little afriad to be honest! I may have to try these and see if I like them. It would be nice to have the option of a healthy snack. I just woke up from a nap and had a handful of each kind! They're soooooo delicious and they have the best crunch! I really want to try these! 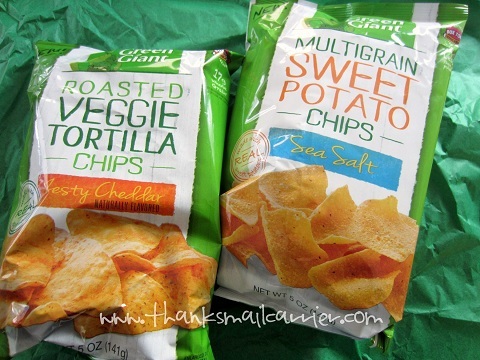 They look quite similar to other tortilla chips (think Doritos) but somehow them being from Green Giant makes me want to believe they are more healthy. Or less junk-y. I will have to track these down and try some for myself! Thanks for sharing! I will definitely have to try these, because I'm always looking for more natural snacks, particularly ones that don't have MSG in them. I love sweet potatoes, and who doesn't love Doritos, so I would love to substitute them with something with less calories, and healthier ingredients. These I HAVE to try. How are they on sodium? 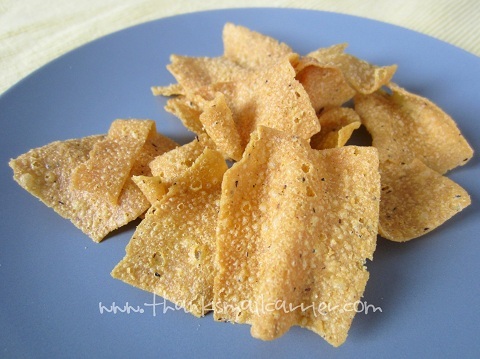 I think I would like to try these veggie chips for good snacking. we just tried these yesterday! SO good! Green Giant is not a company I would have thought would have a line of chips but those flavors sound very delicious. I agree with a previous poster that pointed out that potato chips...traditional potato chips...are made with a vegetable, as well. The marketing is a bit iffy on this one. Although the product may be unique to Green Giant, it certainly is not a completely new concept. Still, I will try the sweet potato flavor. There is another brand I really enjoy but I'm hoping the Green Giant variety has a better price point with comparable flavor. I have had other brands of Veggie Chips, but haven't seen Green Giant brand. I love veggie chips and am going to look for Green Giaant, because I serve frozen Green Giant veggies, and I trust the brand. My favorite flavor is usually Sweet Potato. I can't wait to try these!! I know they will be great. I've not seen this. Though if one is craving some chips, I'd say these could be slightly healthier than other choices. However, they are still processed and chips. Don't get me wrong...I have a little issue with chips myself...LOVE THEM. But I really try to just not buy them and I'm okay. If I do have a hankering for them, I definitely would consider these. Look as I might, I have not been able to find the GG chips in my stores - do you think it is a regional distribution?